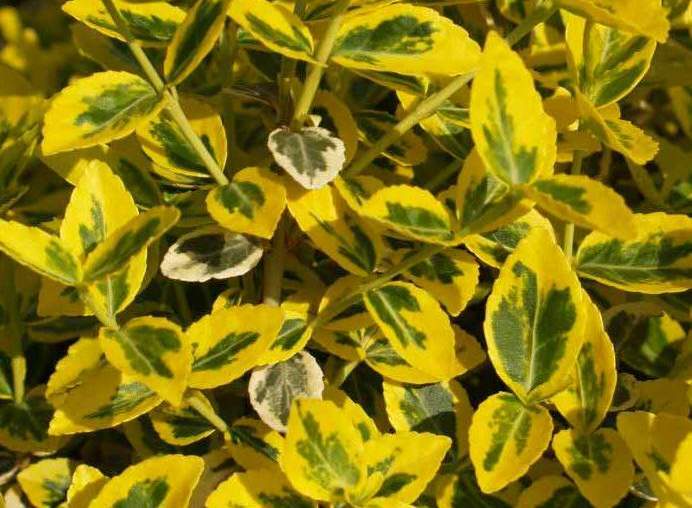 Euonymus fortuneii Emerald n Gold is a small evergreen shrub with a bushy dense habit. The green leaves have a colourful gold edging and a tinge of red in winter. The Euonymus Golden (Euonymus Fortunei Emerald and Gold) makes for a small but pretty hedge that is dense and bushy. The Euonymus Golden, as you’d expect from the name, has green leaves with a golden edging to them, and when autumn arrives, a hint of red creeps upon them. They make for a fantastic low hedge, especially when circumferencing a border or used for ground cover. This hedge loves full sunlight or partial shade and can grow in any well drained soil. It is fast growing and flowers tiny green flowers during May and June. The Euonymus Golden is a low maintenance hedge and one that is easy to maintain. We’d recommend pruning this hedge during mid spring and even late spring, so it can grow its infamous bushy growth and establish itself before the winter frosts set in, later in the year. Once pruned, apply a layer of mulch (about two to three inches should do the trick) around the base of the plant. When planting these hedges it is best to plant them twelve inches apart, and they are desirable for hedges that are one to two feet in height. They’re perfect for creating a bi colour border for your flower beds or to create a feature amongst a shingle section of your garden. This will also help to keep the stones where they should be, and stop them from spilling over as much. We have a range of Euonymus Golden plants available in pot form. For more information on this plant or any of our other hedging varieties, contact our specialist team members for more information.